We stock a wide variety of different Buddhist mallah beads. Each set is perfect for use in meditation or prayer. 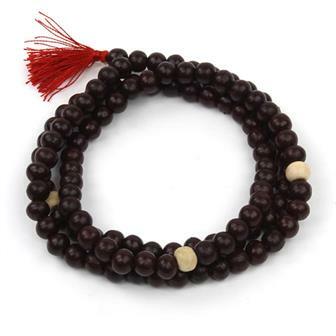 Mallah or Malas are a type of Buddhist Rosary. They usually consist of 108 beads which is a very auspicious number in Buddhism. 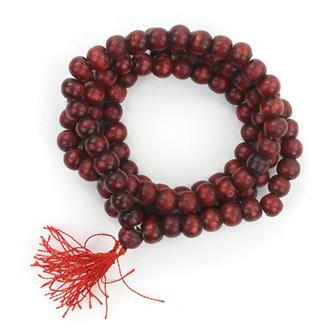 Our best selling mallah is this string of rosewood beads made in Nepal. Malla beads are similar in practice to a Catholic Rosary and are used to aid meditation and prayer. Mallah or Malas are a type of Buddhist rosary. 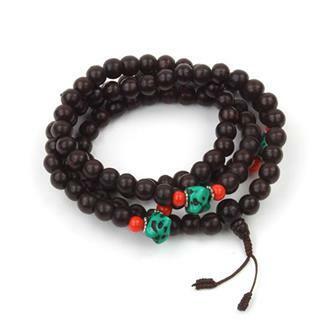 Usually consisting of 108 beads which is a very auspicious number in Buddhism. Malla beads are used to aid meditation and prayer with each bead representing a mantra repetition. A simple set of our best-selling wooden mallah beads presented in a lovely lokta paper box with extra information about Buddhism and the beads themselves. Each mallah contains 108 beads, however some may have extra beads are added in case the practitioner misses some mantras. Simple 28 beaded mallah (prayer beads) with elasticated cord and tassles. 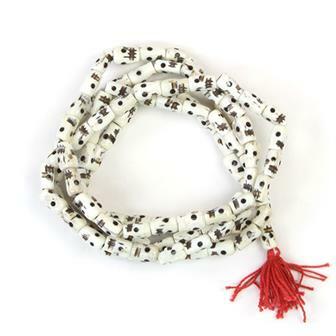 A 28 bead set of mallah beads strung on an elasticated cord, perfect for wearing on the wrist. Each mallah comes in its own little recycled sari pouch with a lokta paper info card making it an attractive gift. Tassel and sari pouch colour varies. 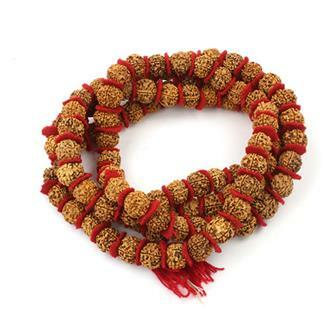 These long mallahs are known as rudraksha in India and Nepal. They are traditionally worn by people such as Hindu ascetics or sadhus. This is because they are believed to protect against negative energies and to aid people who spend a lot of time travelling around. This fascinating and specialist Buddhist rosary is made up of small skulls that have been hand carved from bone. The use of bone as a material for mallah beads is said to be for use only by those with great compassion and altruistic will. Each of these mallahs is handmade in Nepal.